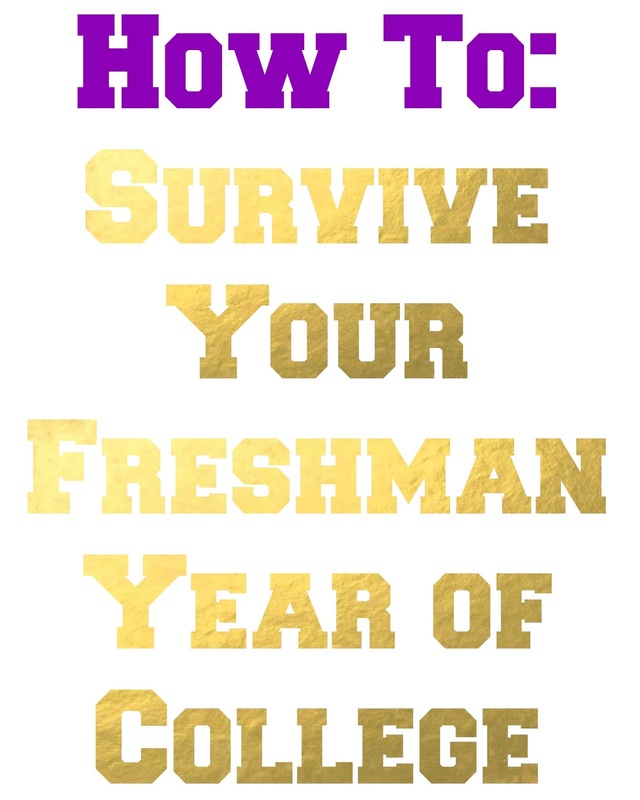 Stnkrbug: How To: Survive Your Freshman Year of College! Ahhh September, the month filled with all things back to school. This term used to absolutely fill me with dread, but now it makes me so excited because I can't wait to get back to college. Decorating my dorm room, seeing all of my friends, wearing my cozy fall sweaters, pumpkin patches...I can't wait for it all! A year ago, however, I was so nervous to start college because it was my freshman year! I was terrified I would hate it, or that I wouldn't be able to stomach the homesickness. Your first year of college is a big undertaking; you're leaving home for the first time, and it's on a whole different level when compared to high school. Since it can seem so overwhelming, I thought I would do a post all about how to survive your first year! I read so many last year to try and get caught up on all the things I needed to know for freshman year, so I knew I had to do one of my own now that I've been through it. 1. Don't get too overwhelmed on move-in day. This can be a very hard day, because you're unpacking all of the boxes you overfilled, you have to say goodbye to your family, and you're living in a completely foreign place. Don't let it get to you too much! Just stay calm, get your boxes (or bags as I did last year) to your room, and just start unpacking. It only gets overwhelming if you let it, so just try and stay calm and excited. Don't let your boxes just sit in your room forever! This gets annoying really quickly, and it's best to unpack right away while you still have help from your family, and while you still have the energy. If you don't unpack right away, chances are you will just leave for the next day, and the next day, and the next day...you get it! Unpacking also makes your dorm feel more like home, which really helps when you start to feel homesick in the coming days. So get your closet done, your decorations up, and your supplies out! 3. Wear a comfy outfit with layers. You will get very warm while lugging up boxes to your dorm, and then unpacking them. I suggest you wear something that is first, comfy, and also an outfit with layers so you can take them off as you get warmer. I did this last year and it really helped! I definitely broke a sweat moving all of my stuff in, so it was nice to just take off some of my layers when it got to be too much. Make sure all of your layers are comfortable and easy to move in as well! 4. It's okay to be a little sad. Once your family leaves, it's totally normal to be sad and to cry a little bit. Everyone is saying goodbye to their loved ones, so you're all going to be in the same boat! It can be hard saying goodbye to the people who you've lived with for 18 years, but try and remember this is an exciting, new adventure. It will get easier as the days go on, but it's natural to be a little sad at first! 5. Get to know your roommate ASAP. You are going to be living with this person for the next year, so make sure to get to know her! This will help break the ice, and help you feel more at home once you know the person you're going to be living with. You both are going to be really nervous, so just talk to her about what all you're excited for, scared about, etc., and you'll start to feel better! I talked a lot to my roommate while we were unpacking, which made the whole process go by a lot quicker, and made it easier to not focus on home. 6. If you don't get along with your roomie, immediately talk it out. The other side of living with someone for a whole year is the negative one; it's easy to get annoyed with someone whom you're sharing close quarters with, which makes dorm-life miserable. The second you start getting annoyed or angry with your roommate, just talk it out. Calmly explain what's bothering you, and maybe try and come with alternate solutions to problems. This can be really hard and awkward, but those couple minutes of a difficult talk can result in a much better year. 7. Find your way to classes before they start. Once you are all settled into your dorm, get to know your new campus, and find your way to all of your classes! It's really important to do this before they start, because you don't want to get completely lost ten minutes before your 8:30 AM class, and end up missing it altogether. I was so glad I did this last year, because I ended up having some difficulty finding a couple of my classes. Instead of figuring this out right before class, I did it a couple of days ahead and found the best possible route to and from my classes. This can also be a chance to make a friend! Just ask someone on your floor to go with you, and chances are they will be totally down. 8. Print out pictures of home, and talk about it to combat homesickness. The first couple of weeks are going to be the hardest. You'll probably be a little bit homesick, stressed about classes, and a little overwhelmed from living on your own for the first time. It really helps having pictures from home hanging up in your room, as well as simply talking about your home with your friends. I underestimated how much this would help, and how much it would allow you to bond with others. They will want to hear about your home, and also tell you about theirs. This kills two birds with one stone because you're able to make really good friends, and help keep homesickness at bay. 9. Leave your door open whenever you're in your room. Leaving your door open to your dorm is kind of a single saying "Hey! I want to make friends so come say hi!" People will actually swing in and introduce themselves, and it makes it so much easier to get to know people! Your floor will become closer if you all meet each other through open doors, and you'll most likely meet some of your best friends this way. My first week was filled with awkward introductions that we all laughed about later, and most of these people became my closest group of friends. 10. Ask questions in class, and go to office hours. Okay, this can be very scary, especially when you're in a lecture hall full of 500 students. I am a very shy person, so it took me a little while to fully become comfortable with asking questions or answering them. This can be really beneficial, though, because you don't want to be confused in any of your classes! That confusion can pile up very quickly, and make learning other concepts difficult. It's better to just clear the air as soon as possible, and your professors like being asked questions! It shows you are an engaged student who really wants to learn, and they get to know you better and put a name to one of the many faces they see. You can also go to your professor's office hours if asking questions during lecture scares you too much, or if you have a lot of questions. 11. Form study groups and actually study with them. A great way to make friends in your classes is to ask people to study with you! Forming a solid study group you can meet with the whole term is a great way to do well on exams. Your first finals week can be really scary, so it helps you study with other people who are in the same situation as you. It's also a very collaborative process because you can all learn from each other, and it really helps when you teach someone a concept, because it solidifies the knowledge in your own brain. You are on your own for the very first time, so it's important to make good decisions, because you will have a lot to make! You're now entering the real world (albeit a more sheltered one being in college), so you will have to make real life decisions. Just make sure you keep yourself safe, and that you don't put yourself into any dangerous situations. You can always call your parents when you need advice, because they will most likely gladly give you some! 13. ...but don't be afraid to make mistakes. You will make mistakes, and that is okay! How else are you going to learn? I made my fair share of mistakes last year, and I know I have many more to make. We're young, so it is to be expected. Don't beat yourself up over these mistakes, though! Mistakes can be learned from, and the next time you are in the same situation, you know not to make the same decision as last time. Think of them as real-world-life-lessons, and also realize that all of the successful adults of today made the very same mistakes. 14. It's okay to change your major. It's okay if you change your major three times within the same term, we all do it! I had a plan of what I was going to study in college, and it is not the same one I have now, or probably the one I'm going to have by winter quarter. Some people do stick with their original major, and total props to them, but plans can change very quickly in college. You are able to take classes about what you truly love for the first time, and it's okay to take a class and realize you actually hate it. Everyone does this, and it's better to figure it out your freshman year, rather than a couple of months before you graduate! College is the time to get to know yourself, find out what your dream and aspirations are, make mistakes, and to ultimately have the time of your life. You will have so many ups and downs, but at the end of the day, college is really incredible. You have to rely on yourself for the first time, and you make some of the best friends you've ever had. These people turn into your family, and you really will make memories to last a life time. So don't take yourself too seriously (although, take your classes seriously! ), and enjoy the ride! Home is also always a phone call away, so when you're feeling too overwhelmed, take some time out and call your loved ones. Are you excited for school? I am so excited to be back in College. Last year it got quite hostile in my house even though we didn't share rooms. Definitely helps to confront and be honest with your room mates when you have an issue.